U21 Championship. 3rd round. August 6, 2016. Schaslyve. Knyazha Arena stadium. 30 oC. Att: 200. 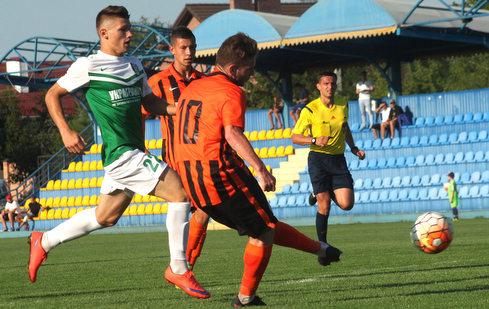 The league leaders Shakhtar approached the game without any personnel problems. The Pitmen’s starting line-up features Vyacheslav Tankovskyi, Mykola Matviienko and Andriy Boriachuk, who train with the first team, with Oleh Kudryk taking his place in the goal. 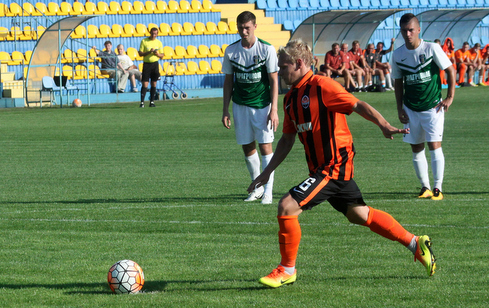 Oleksandriya had Vladyslav Ohyria playing from the off, he has the experience of playing in the Premier League. Shakhtar got off to a powerful start and took the lead already in the 8th minute. The visitors’ goalkeeper made a mistake, going out of the penalty area, while Mykyta Adamenko picked up the ball and chipped it into the back of the net – 1-0. The charges of Valeriy Kryventsov doubled the lead very quickly. Giorgi Arabidze bent his direct free-kick into the back of the net past the near post – 2-0. Boriachuk might have got himself on the scoresheet immediately afterwards, though he failed to beat the goalkeeper. However, Andriy scored his goal later, after Mykyta Adamenko earned a penalty, which was immaculately converted by Vyacheslav Tankovskyi – 3-0. And in the 35th minute, Arabidze put Andrii Boriachuk one-on-one with the goalkeeper. The forward coolly beat the goalkeeper to make it 4-0 at halftime. The break has not brought any significant adjustments to the game: the Donetsk side were superior to their opponents in every component and could score no less than in the first half. On 58 minutes, Giorgi Arabidze received a pass in the right-hand corner of the penalty area and drove the ball home to make it 5-0. Shakhtar had some other successful fluid attacks later, but they lacked a precision shot. Boriachuk found himself a few times one-on-one with the goalkeeper, but failed to score. A powerful free kick by Arabidze shattered the woodwork. The substitution player Oleksiy Zinkevych had two great chances: on the first occasion the keeper handled it; and on the second one, the ball went just wide. 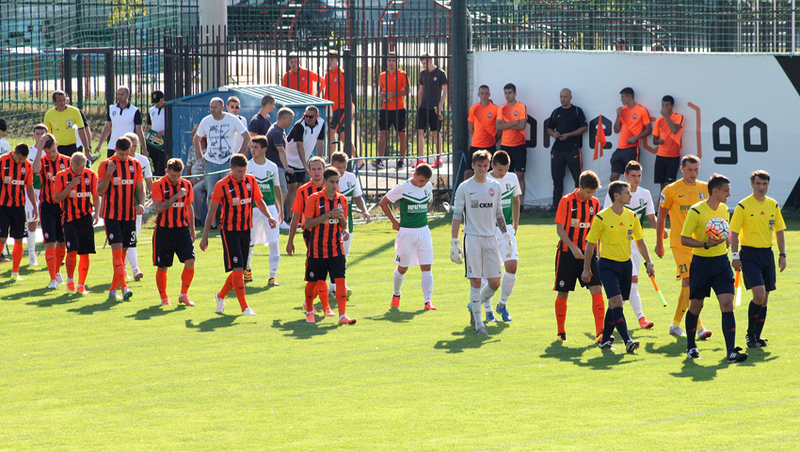 5-0 - the scoreline reflects the great advantage of Shakhtar over Oleksandriya. 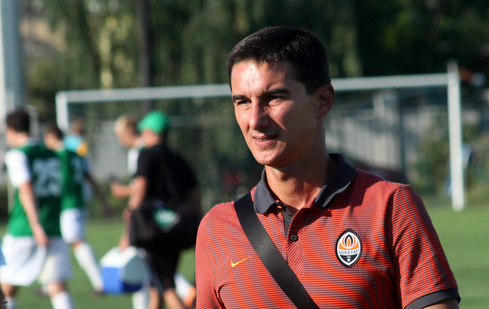 The team of Valeriy Kryventsov will play their next game away against Karpaty Lviv on August 11. - I like the fact that the result of the match is completely logical and reflects what was happening on the field. But even more I like the organisation of the game, the quality of football demonstrated by the team and the boys’ attitude to their job. They are trying to fulfil on the pitch everything we suggest to the players, the way we see the game pattern, enjoying it themselves. And this is very important: to develop the players so that they find it interesting to work. So we are moving in the right direction. I also hope that the current high level of competition in the team will motivate those who do not appear in the starting XI, but who we want to see there. Our goal is creating a kind of machine team, which, regardless of the opponents and other factors, play their game and achieve the maximum results.